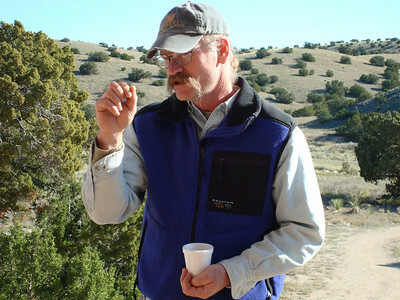 October 1-4, 2009. 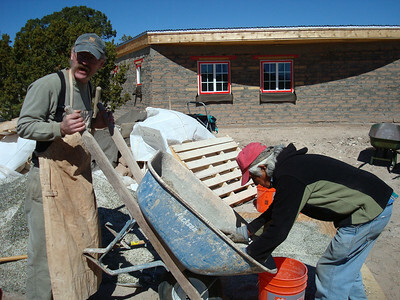 Sustainable building for the 21st century! 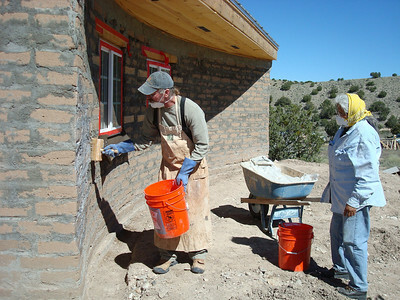 Four day, hands-on lime plaster seminar at Hamaatsa with Tim White of Traditional Building Systems and Models. 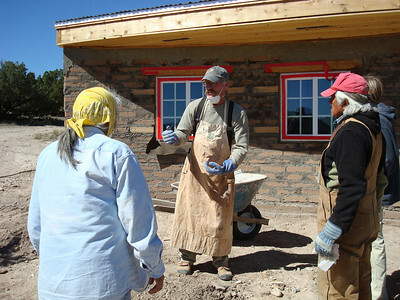 A group of twelve participants experienced all stages of the lime plaster process while working in real time on our first adobe house. 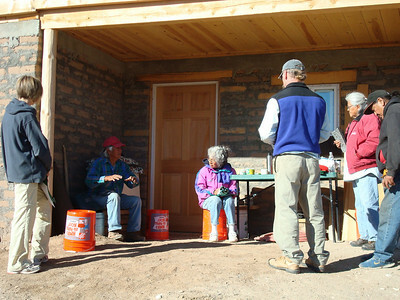 Through the generosity of three sponsors we were able to scholarship six Native individuals from the neighboring Pueblos. 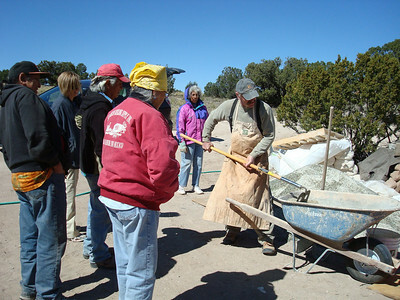 Lime Stucco seminar participants. 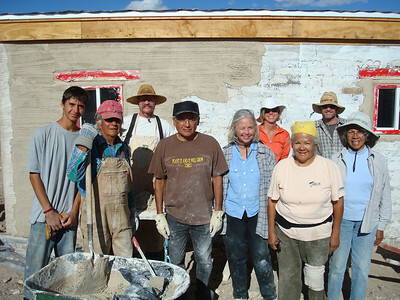 From left to right, Raine Littlebird, Larry Littlebird, Tim White, Alan Toledo (Jemez Pueblo), Patty Wasterman, Laura Mack, Wilma Toledo (Jemez Pueblo), Daniel Goldthwaite, Mary Toledo Tang (Jemez Pueblo). 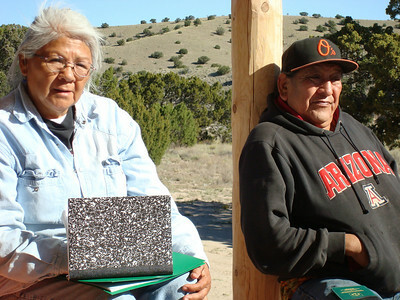 Not in picture, three Pueblo men and photographer, Deborah Littlebird. 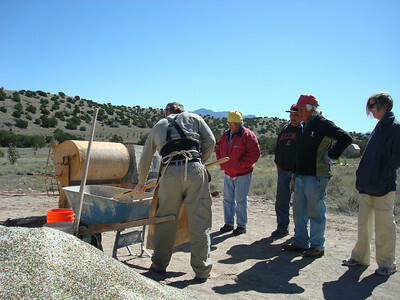 Lime stucco process begins with "bulking" sand. 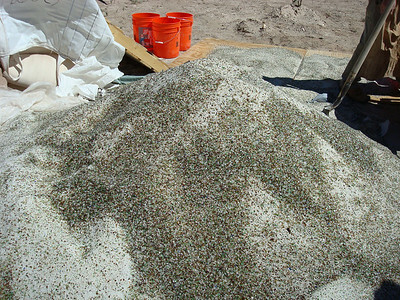 Aggregate used to make plaster is coarse sand with ground up glass. 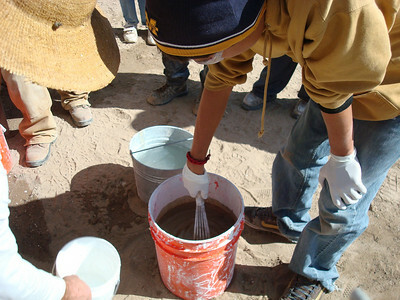 Bulking sand for use in the lime plaster "mud" mixture. 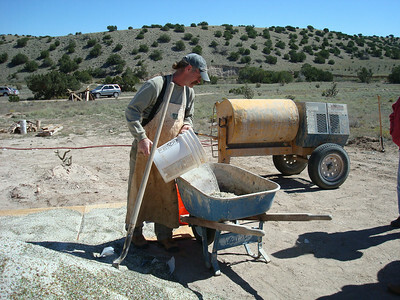 Larry Littlebird mixing lime plaster "mud" in the paddle mixer. 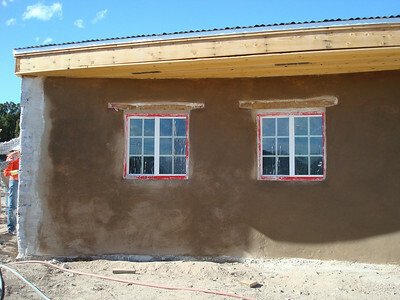 First layer on house is a lime plaster wash. 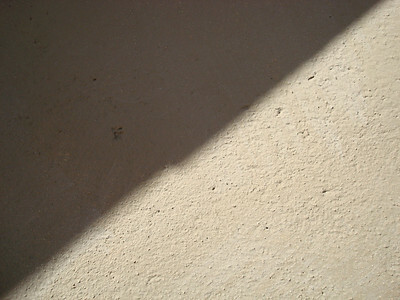 It dries white and is used like a primer. 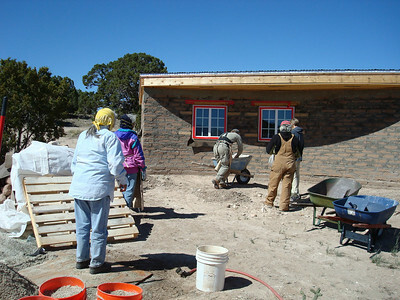 Next, comes the application of the first lime mud layer put on with a a "hawk and trowel". 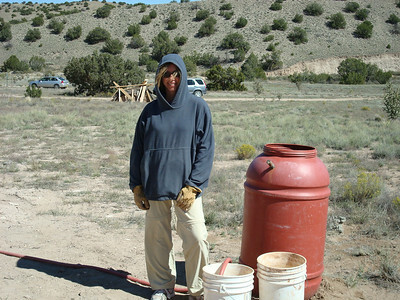 This is called the "scratch coat." 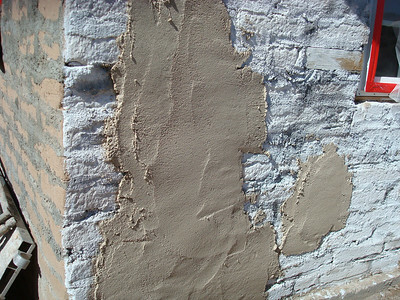 Scratch coat with a raking tool. 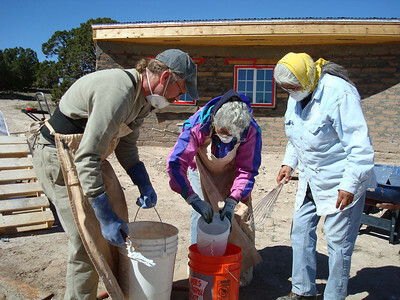 The final layer of plaster is applied and then "wood floated" to give the plaster a smooth finish. 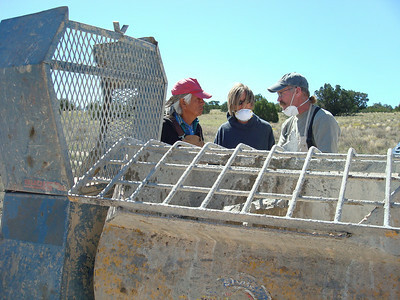 It is like a light massage and Alan Toledo has the right touch! 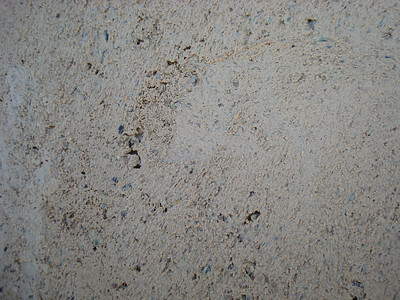 Close-up of finished "wood floated" finish. 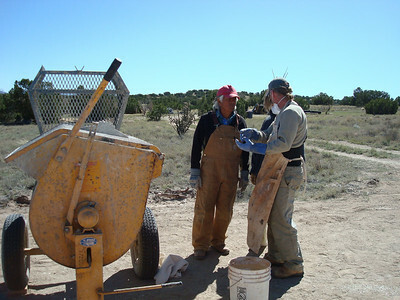 The last step is applying color pigment to the lime wash to give the desired color. 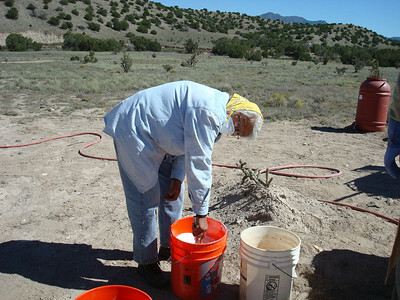 You can also keep it white for a white washed finish. 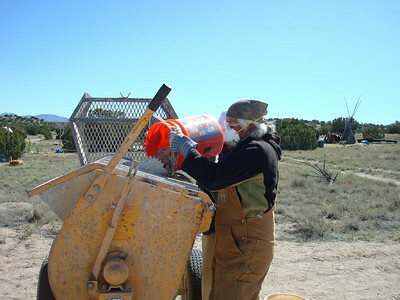 We added a light tan color for our final wash. 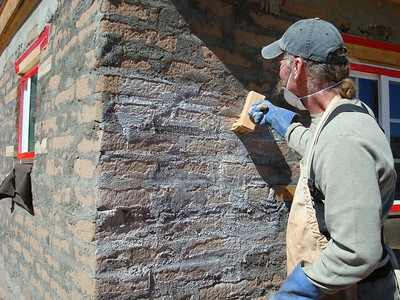 The final lime wash with pigment is applied with a brush. 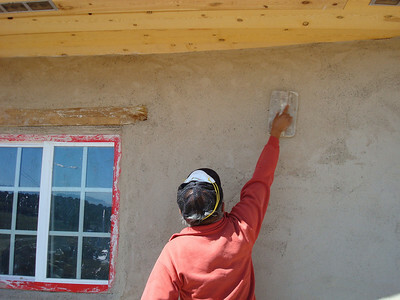 You can apply several layers of lime wash to the walls which makes the wall very hard and durable. 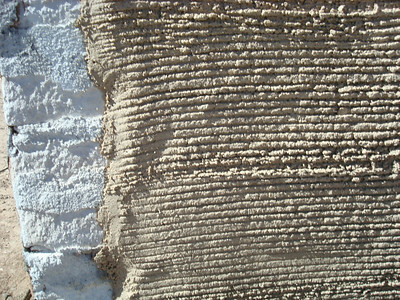 Close-up of the final lime wash finish with tan pigment. 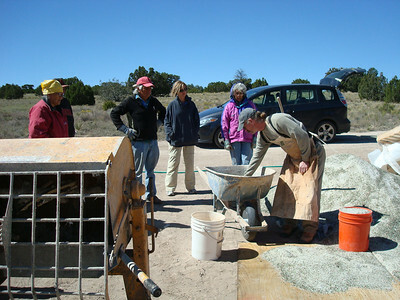 The following photos show various stages of the lime stucco process with participants over the four day seminar. 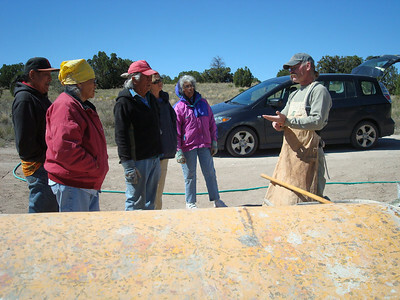 Instructor, Tim White begins with an overview of the history and process of lime stucco.